Inner skins primed and masked for tape in trailing edge. Started to back rivet the stiffeners to the skins. Back riveting should be fairly straightforward unless you slip off the plate and dent the skin – cue colourful language. Quick call to another 14 builder (thanks Robbie) and he suggested dimpling the skin again with the c-frame to push the dent inwards. It worked. Not perfect but I think it will be fine and I will wait to see what my inspector says. 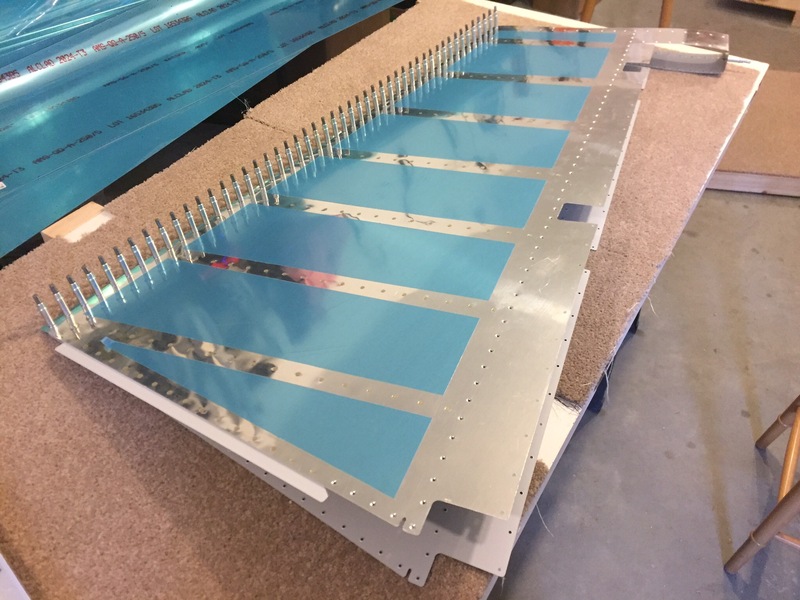 Next step is to blind rivet the shear clips to the stiffeners – no jeopardy here as long as you put them up the right way. Final stage is to stick the trailing edge wedge to the skin using the tape called out by Vans. Not an easy tape to find but I found the 3M double sided tape on eBay of all places. Now for the fun, the skins come together and the stiffeners need to be blind riveted to the shear clips in three places. To do this you have to bend the skin back on one side and access each set of stiffeners. Not easy unless you have small hands but we managed. You have to cleco the the trailing edge as you go, peeling back the tape backing so you get a good join. 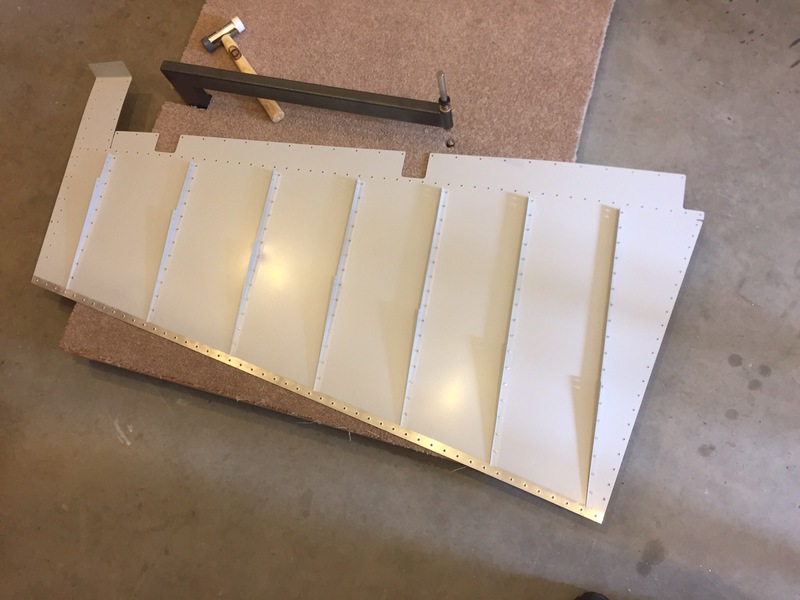 The trailing edge looks reasonably straight, not perfect but the edges are nicely joined. I think I bent the wedge a little while we were fighting to get the stiffeners together. 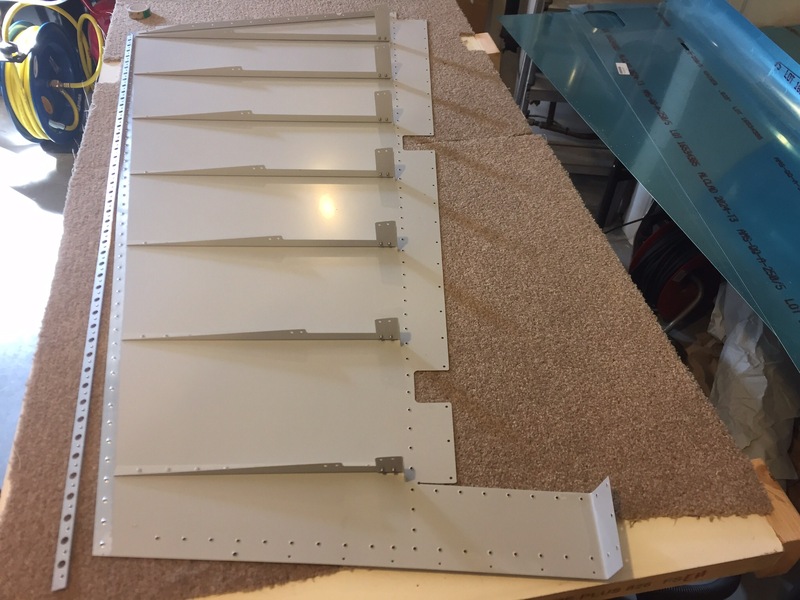 Next step is to get the assembly inspected before attaching the rear spar. Be the first to comment on "Rudder 07-06 to 07-09"